Fallen Angel (Her Angel: Bound Warriors Paranormal Romance Series Book 2) is out now! Lukas has landed once again! The extended new edition of my angel romance book is out now. Fallen Angel is the second novella in the Her Angel: Bound Warriors series, and expands on the Her Angel world. Her Angel: Bound Warriors is a series that will feature extended and revised edition of the original Her Angel novellas, plus a brand new novella that will round out the story arc of this cadre of angelic warriors. You’ll be able to read it with your Kindle Unlimited subscription if you have one! 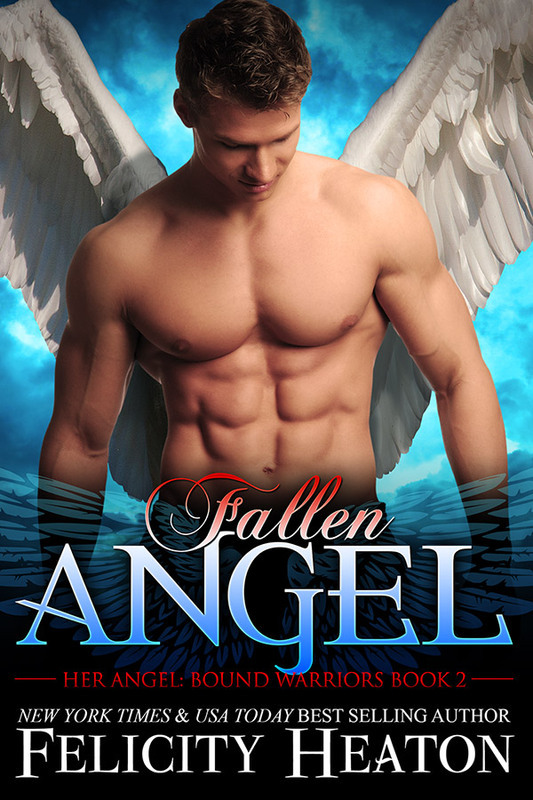 Read on to find out all about Fallen Angel, get the links for your favourite Amazon store, and read an excerpt! Cast out of Heaven for a crime he didn’t commit, Lukas has spent three years searching for a way to prove his innocence and slowly falling for a beautiful mortal female. When things take a turn for the worse, he seeks solace in the bottom of a bottle and ends up finding it in Annelie’s arms. But one moment of Heaven becomes one of sheer Hell when his wings make an unexpected appearance. Now, he’s in danger of losing not only his duty, but the woman he loves. Annelie fell for Lukas the moment he walked into her bar and she fell hard. The tall, sensual blond sets her heart on fire with his otherworldly green eyes and wicked smile, so when one kiss leads to something more, seizing her chance and Lukas with both hands seems like a great idea… until morning rolls around and she discovers he’s not the man she thought he was—he’s an angel. Lukas will stop at nothing to prove both his innocence and his love for Annelie, but when he discovers who framed him and she ends up caught in the crossfire, will he be strong enough to protect her? And can Annelie vanquish her doubts and fears to claim the heart of her fallen angel? Lukas was looking worse for wear. Annelie had never seen him drink alcohol. She had often wondered why he came to her pub but stuck to soft drinks. Seeing him slowly sliding down towards the wooden bar, his head propped up on his hand and his eyes closed, she was no longer surprised that he lay off the booze. His scruffy sandy locks fell forwards when his head slipped from his hand and he jerked up. He rolled his eyes a few times while blinking and then pulled a face as he inspected the damp elbow of his black shirt and the wet bar where he had been leaning. A sigh lifted his broad shoulders and his green eyes shifted to the half-full glass of whisky in front of him, growing a little unfocused as he stared at it. He turned it on the bar, canting his head to his left as he studied it. The soft lighting above him reflected off the glass, casting patterns over the dark wood, and his gaze went from unfocused to hazy. Either he was lost in thought, or the whisky was really taking its toll on him. Perhaps she should have cut him off after his third, but his charming smile had persuaded her to supply him with a fourth, and a fifth. She regretted it now, her stomach squirming whenever she looked at him and saw the effect of the alcohol on him. At the time, he had looked as though he would be fine. Now, he looked as though he was going to pass out. Heck, maybe she shouldn’t have given him the first shot. What if he didn’t drink because he was an alcoholic and she had just ruined his recovery? She would never be able to live with herself if that was the case. She handed some change to a patron and walked along the length of the area behind the bar to Lukas, neatening her appearance as she did so, a nervous habit she couldn’t quite get under control whenever she was heading in his direction. Her heart rate jacked up as she tugged the hem of her black baby-doll t-shirt down to sit smoothly along the waist of her black jeans and combed her fingers through her long red hair. She always felt as though she looked like a mess whenever things got frantic behind the bar. And she wanted to look her best for Lukas. She had been deeply aware of her appearance from the moment she had first set eyes on him, felt self-conscious whenever his eyes landed on her, and ached for them to return to her whenever he looked away. Did he know how badly he affected her? Posted in 2018 releases, angel romance, Fallen Angel, Her Angel: Bound Warriors, new release, paranormal romance, witches	| Comments Off on Fallen Angel (Her Angel: Bound Warriors Paranormal Romance Series Book 2) is out now! Dark Angel (Her Angel: Bound Warriors Paranormal Romance Series Book 1) is out now! It’s finally here! The extended new edition of my angel romance book is out now. Dark Angel kicks off the Her Angel: Bound Warriors series, and is a novella that introduces the Her Angel world and one of the most powerful angels in this paranormal romance series. Each book in the series will be only 99c / 99p and you’ll be able to read it with your Kindle Unlimited subscription if you have one. Read on to find out all about Dark Angel, get the links for your favourite Amazon store, and read an excerpt! Centuries in Hell have taken their toll on Apollyon. Tired of guarding the Devil, he longs to break free of the dark realm. The trouble is, he can’t leave without permission. When he feels someone calling him, he seizes his chance for freedom, but what awaits him in the mortal realm is the last thing he expects—the beautiful woman he has watched over from Hell, a witch who casts a spell on him and awakens the darkest desires of his heart. Serenity is shocked when a wickedly sensual black-winged angel shows up in her city of Paris claiming that she summoned him when she was only casting a simple vengeance spell. He’s no other than the angel of death! A very gorgeous, alluring angel of death who makes her feel she’s in danger of getting her heart broken all over again. When the lethally handsome warrior offers to obey her and give her revenge, Serenity can’t resist the temptation, but can she resist the forbidden hungers the dark angel stirs in her? The images in the bright pool flickered past Apollyon’s eyes at lightning speed but he could see them all, could bring each into focus and pause there a moment to understand what was happening in the scene before discarding it and allowing the flow to resume. It was a distraction he used daily, his every hour devoted to watching over the mortals. In the long centuries he had studied the human world, he had seen a million or more changes, from the smallest accidental discovery to the grandest scheme that had altered the future of the race. He had witnessed the growth of the mortals. He had watched them forget his kind. No one believed in angels anymore. And his master had not called him forth from the bottomless pit in Hell in all the time he had been assigned to the dark realm of smoke and fire, hundreds of years passed choking on the stench of sulphur and bearing the presence of demons, and the king of Hell’s vicious taunts that rang in his ears on a daily basis. Yet Apollyon waited for the call to come, faithful and patient, committed to his duty even as others around him chose to live by their own commands. He had heard the tales from angels who had reason to enter Hell, whispers and rumours about how their fellow warriors had softened and fallen for mortal women, their devotion wavering and their commitment altering to their love. He would do no such thing. Posted in 2018 releases, angel romance, Dark Angel, Her Angel: Bound Warriors, new release, paranormal romance, witches	| Comments Off on Dark Angel (Her Angel: Bound Warriors Paranormal Romance Series Book 1) is out now!